Twitter is buzzing again, this time for its makeover of sorts. Even though not many intermediate and advanced Twitter users go to twitter.com and prefer using Twitter clients – still, many new Twitter user only know twitter.com as gateway to Twitter. Checkout the following and followers pages of your Twitter account. They look more compact and jazzed up with fancy action buttons next to each Twitter user listing. You can click on arrow button next to each profile listing and then select among other options like sending a direct message, mention, follow or block the user. You can also switch among two different views: expanded and list. 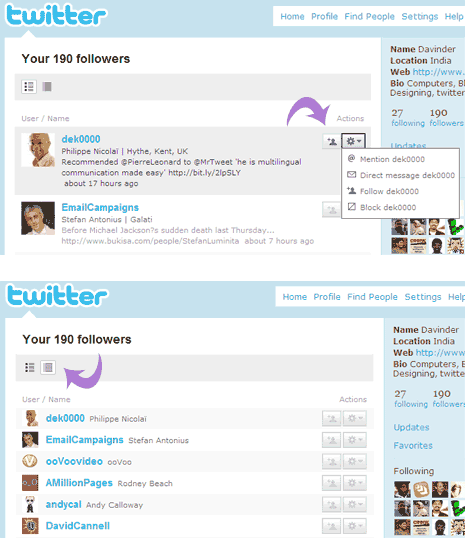 These interface changes for sure make followers – following page more neat and manage-able, what say?